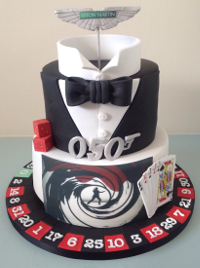 Our celebration cakes are custom made to your requirements. 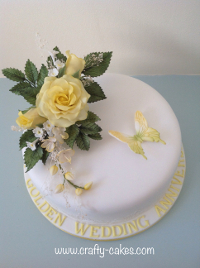 Whether you are planning a birthday, anniversary or celebrating a golden wedding it deserves a fabulous cake. Lyn can create a fun novelty cake for kids and adults alike or a beautifully piped and decorated cake to celebrate a christening or birthday adorned with her beautiful sugar flowers. Christmas and corporate cakes are also catered for – the list is endless! 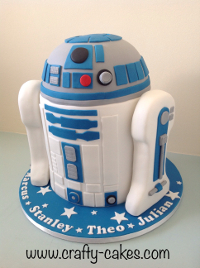 Any of our celebration cakes can be made in different shapes or sizes and you can choose from a selection of fillings - any design or colour can be adapted to compliment your theme. Prices range from £25. The gallery page shows a selection of designs. Crafty Cakes provides a delicious selection of cookies that can be used for edible wedding favours or any celebration. Our cookie range includes classic vanilla, zesty lemon and scrumptious chocolate. All of our Cookies are freshly baked and made with quality ingredients. We offer an extensive range of shapes and sizes which can be personalized to suit your theme – wedding, christening, birthday, graduation, baby shower etc. Our Cookies are either, individually wrapped in clear/colour coordinated bags tied with ribbon or packed in a small petite fours box. Prices range from £2.00 each. 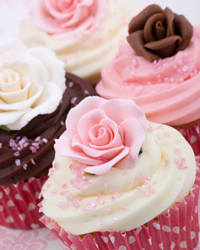 Cupcakes are a modern alternative to the traditional wedding cake. They are also suitable for birthdays, christenings or anniversaries. All of our cupcakes are freshly made to order and are designed and decorated to suit your theme. Prices range from £2.00 each.